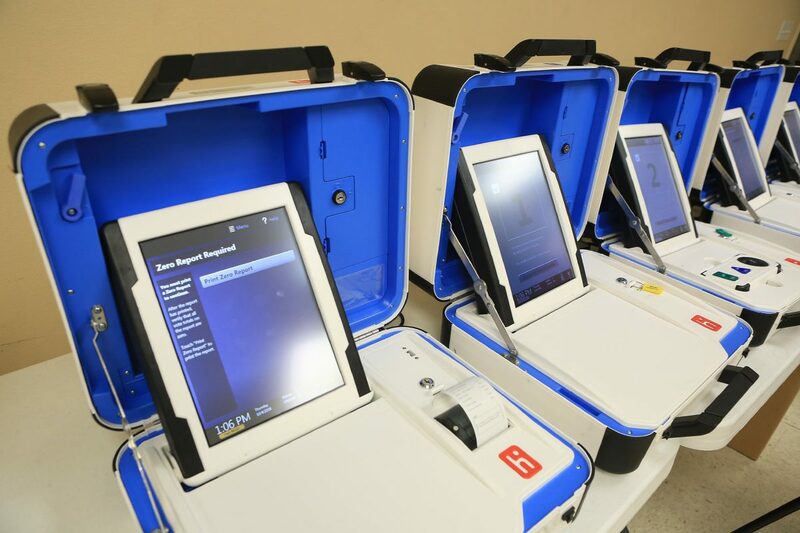 New voting machines are displayed at the Hidalgo County Elections Department on Thursday, Oct. 4, 2018, in Edinburg. EDINBURG — Voter registration in Hidalgo County is at an all-time high, but voter turnout continues to be low, elections administrator Yvonne Ramon said. As of Thursday, more than 359,000 county residents had registered to vote. That’s about 10,000 more voters added to the rolls since the March primary, Ramon said. “Unheard of,” the elections administrator said about the recent uptick in registrations. “I’ve been here 10 years and for the first five years we managed to stay between 290,000 and 310,000, because the state, after every federal election, purges (the rolls). But no, even after purges the number continues to climb and climb. 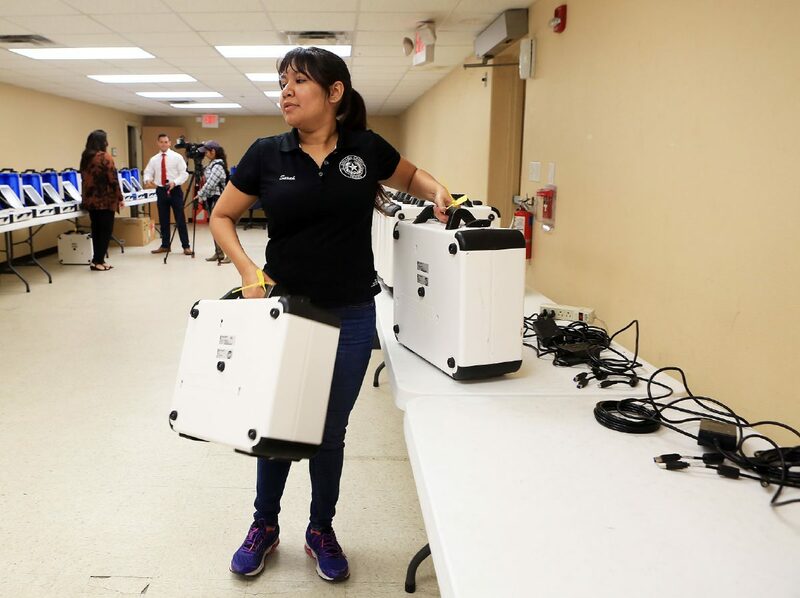 Sarah Garcia, Hidalgo County elections employee, carries the new voting machines at the Hidalgo County Elections Department on Thursday, Oct. 4, 2018, in Edinburg. Still, registration means little if voters don’t cast a ballot come November. And in preparation for the upcoming election, Ramon’s staff this week began testing the county’s 696 voting machines for accuracy and logic. It’s a process that allows candidates, media and members of the public to observe the machines at work and double-check that they are working properly. Once a machine has been successfully tested, they are placed in locked containers and stored away until early voting begins. “So the next person to open them will be the judge at the polling location,” Ramon said Thursday. Her staff has recently been working closely with the county’s IT department to combat potential threats. The county is also working closely with the U.S. Department of Homeland Security, which is providing resources, like training, education, support, and technical services, and has also applied to be part of the FBI’s Infragard program. And while the county has yet to be accepted into the FBI program, it’s already participating in MS-ISAC, a cybersecurity resource for local, state, territorial and tribal governments, with Homeland Security, Ramirez said. Certain county employees receive daily notifications about viruses targeting particular cities or systems, allowing staff to be more proactive. Cyber attacks are a constant threat.